This morning I (Susan) went to town with some friends to do a little shopping. Kainantu (pronounced “k-eye-nan-too”) is the nearest town to Ukarumpa, about a 15-minute drive away. There isn’t much there, but it does offer a change of scenery. We went to the grocery store and then to some of the secondhand clothing stores. 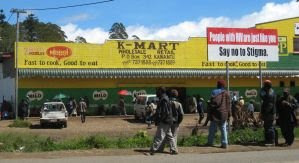 As you can see from the picture, we have a “K-mart” in Kainantu…though it’s not quite the same as back home. This K-mart sells a very limited supply of groceries, and that’s it. As you can see from the billboard out front, HIV is a growing concern in Papua New Guinea. Many aid agencies are working in Papua New Guinea to prevent the spread of HIV because they realize that it could turn into another Africa if the problem is ignored. Living in a small “town” like Ukarumpa doesn’t offer many entertainment opportunities. There are no restaurants, movie theaters, or coffee shops. So for many people a trip to Kainantu, while not that thrilling in itself, is a welcome change of pace. For a large number of women here, secondhand clothes shopping is a favorite pastime. Clothes are cheap, but there are no dressing rooms, so you just buy a bundle of items and hope that most of it fits when you get home. There is one nice restaurant at a local hotel where you can go on special occasions, but for everyday eating, there is a fast-food chicken place that is really pretty good. No one is sure what to call it though, because it was supposed to be “Highlands Fried Chicken”, but when they painted the sign, they forgot to put the “h” in the middle of Highlands, making it “Higlands”. At Higlands you can get a chicken sandwich, fries and a soda, and feel like you’re almost at home! I have just read your blogs and they are wonderful. I love all the information you have given. After reading about the foods you gave and the gardens, I wondered if you would like us to send you some seeds to plant - or give others to plant.